By focusing on a wide range of reading and study skills required in the academic world, Reading and Study Skills gives instructors the flexibility to address student needs that might otherwise require several texts. The highly versatile organization divides topics into focused, self-contained modules that can be covered in any order resulting in a text that can be adapted to fit any teaching or learning situation. 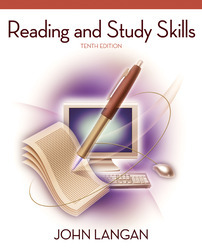 From its step-by-step, comprehensive coverage of the essential reading and study skills, to its practical, sensible style and tone, this text encourages and motivates students to get the most out of their reading and shows them how to master key study skills in order to have rewarding college experiences. In Part One, Motivational Skills now include a useful set of tips and strategies to help students develop self-motivation so that they can be more effective learners and participants in their everyday lives. Media Links: This edition of Reading and Study Skills includes icons that link the text and its class-tested Online Learning Center. Each chapter in this edition features marginal icons that alert students to additional exercises and supplemental resources for the topic at hand. Learning Objectives/Visuals: A list of learning objectives and PowerPoint slides supplement each chapter of the textbook. Exploring and Writing Activities: Exercises encourage students to explore sites on the Web related to each chapter topic, and journal activities prompt students to write about what they have learned from a chapter. Interactive Quizzes: Multiple-choice questions reinforce comprehension of key concepts and skills. Additional Resources: Offerings include a learning styles assessment, a guide to the Internet, a guide avoiding plagiarism, a study skills primer, and more. Inclusion of a revised full-length chapter from the introductory textbook Sociology: The Core, by Hughes and Kroehler, gives students extensive practice in reading, taking notes, and responding to exercises, understanding various graphics (such as tables and graphs), and taking study notes on a full-length chapter. Helpful Learning Aids Accompany the Book: (1) An Instructor’s Edition (ISBN 0077426940) consists of the student text complete with answers to all activities and tests, followed by an Instructor’s Guide featuring teaching suggestions and a model syllabus. (2) An Online Learning Center (www.mhhe.com/langan) offers a host of instructional aids and additional resources for instructors, including a comprehensive computerized test bank, a downloadable Instructor’s Manual and Test Bank, online resources for writing instructors, and more. (3) The online content of Reading and Study Skills is compatible with WebCT, eCollege.com, and Blackboard. Two new readings: “Wired for Touch” and “A Door Swings Open” have been added to Part Six, offering a moving look at the importance of human touch to our everyday lives and an inside view of how one woman coped with a life-threatening illness. Flexible Format: Self-contained sections on reading and study skills within each of the eight parts of the book allow instructors to adjust the book to the needs of their students. Comprehensive Exercises: A wide variety of activities allow students to practice reading and study skills. Accessibility: The presentation of key skills as processes that can be mastered in a step-by-step sequence makes this text accessible and user-friendly. Practice: A separate, full-length chapter from an introductory sociology textbook gives students practical experience in working with the kind of material they will encounter throughout their college career. Profiles of Successful Students: Each of the eight parts opens with a profile of a student who has overcome obstacles to succeed in college and provides an inspiring example of the skill to be covered. Motivational Skills: The opening chapter of Reading and Study Skills addresses motivation, attitude, and goal-setting as key elements of successful class work. Realistic: It uses material taken from a variety of college textbooks and gives practice in common study situations. Students are asked to transfer skills to actual study and classroom activities. John Langan has taught reading and writing at Atlantic Cape Community College for more than 25 years. The author of a popular series of college textbooks on both writing and reading, John enjoys the challenge of developing instructive materials that are clear and lively. Before teaching, he earned advanced degrees in writing at Rutgers University and in reading at Rowan University. He also spent a year writing fiction that “is now at the back of a drawer waiting to be discovered and acclaimed posthumously.” While in school, he supported himself by working as a truck driver, a machinist, a battery assembler, a hospital attendant, and an apple packer. In addition to his wife and Philly sports teams, his passions include reading and conveying to nonreaders the pleasure and power of books. Through Townsend Press, his educational publishing company, he has developed the nonprofit “Townsend Library”—a collection of more than 100 new and classic stories that appeal to readers of any age.